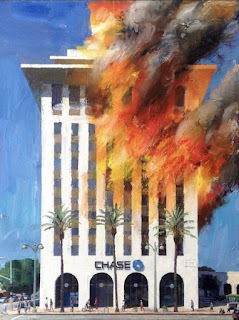 Dangerous Minds introduces us to the genre and its primogenitor of “Disaster Capitalism” with a profile of Los Angeles-based artist Alex Schaefer, who channels his talent into images of mostly local bank branches engulfed in flames. Because of the police-state that America has embraced, charged with protecting the system that has created and sustains the huge underclass of the 99.99%, Schaefer’s works have garnered the unwelcome publicity of the Department of Homeland Security—accusing him of casing joints for robbery or arson. I am sure that many of us could keep the artist occupied for years with commissions of our friendly neighbourhood financial institutions.